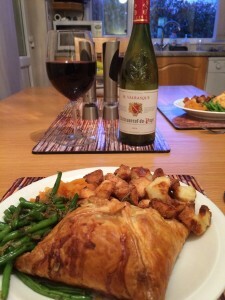 We had family round for a meal and cooked Supercook’s Tournedos Chasseur, which is a classic French dish of fillet steaks with ham, mushroom and white wine sauce. We served the steaks with carrots and little roast potatoes. We tried two wines with the dish. 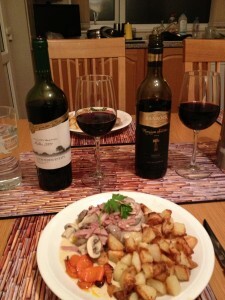 Our guests brought with them a bottle of Banrock Station Premium Merlot, 2012, a medium-bodied Australian red from Tesco. We found this smooth with peppery spiciness and black fruits and we all agreed this was a very good match with the steak. We opened a bottle of Schroeder Malbec 2009, an Argentinian red from the Sunday Times Wine Club. This was full and smooth with red fruits, vanilla and chocolate orange notes and someone detected aniseed. Not as good a match, but one guest did prefer this wine with the steak. 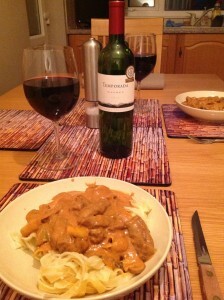 We decided to try the Masterchef Stroganoff from Food.com. The strips of beef fillet are tossed in sweet paprika, flour and salt and pan-fried. The steak strips are then combined with a sauce containing caramelised mushrooms, shallots, tomato paste, brandy, beef stock, Worcestershire sauce, and crème fraîche. We served the meal with noodles. I enjoyed this slightly different take on Beef Stroganoff, but Teresa thought the flavours were dominated by the sweet paprika. We paired the Stroganoff with a bottle of Temporada Malbec 2012, an Argentinian red from the Wine Society. This had peppery spiciness, and was dark, full and rich with black fruits, vanilla sweetness and smooth tannins. We both thought this was a lovely wine and a very good match with the meal. We had some fillet steak to cook and found a previously-tried BBC Food recipe called Steak Diane with Brandy and Mustard Sauce. We paired it with a bottle of Torres Las Mulas Cabernet Sauvignon Reserva 2009, a Chilean red from Waitrose. This excellent full-bodied wine was smooth with blackcurrant, red fruits and vanilla. It was delightful with the steak. 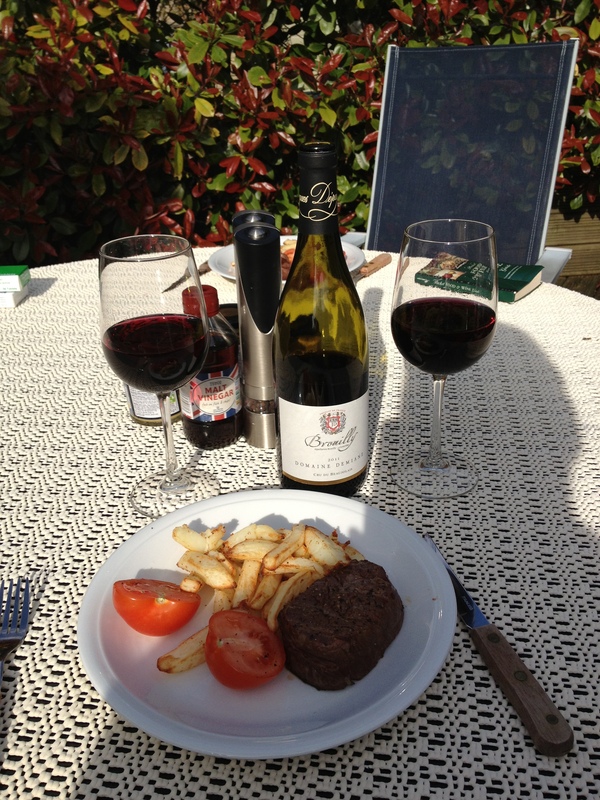 We treated ourselves to some fillet steak and used it in Tournedos Sauté aux Champignons from Supercook. This is steak in a mushroom and red wine sauce. Supercook recommended a claret. We opted for a bottle of Espitalet des Anges Cabernet Merlot 2007 from Sunday Times Wine Club. This is a southern French Cabernet/Merlot blend, designed to give Bordeaux a run for its money according to Laithwaites. It complemented the steak beautifully. The combination accentuated the deep blackcurrant character and juicy plummy flavours in the wine. We had a nice little treat tonight. Fillet Steak coated in Rosemary, Thyme, Parsley, Garlic and a Dijon mustard mixture and done on the barbie. We decided on a bottle of Gran Calero Yecla 2006 from the Sunday Times Wine Club. This is a Spanish red from Murcia made predominantly from Monastrell (aka Mouvedre) with some Syrah. Dark, rich and smooth. 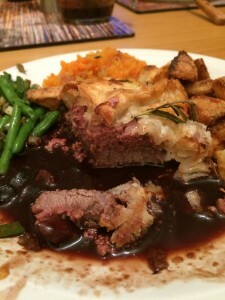 The complex black fruit went very well with the meaty, herby, savoury flavours of the dish.